Chefs Cortney Burns and Nick Balla. Photo by Chad Robertson via Facebook. 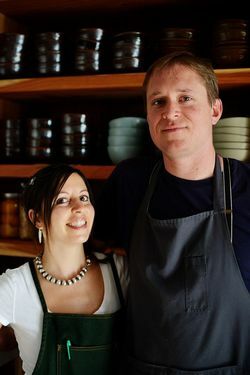 I know I’m not going to be the only one bummed over the news that Cortney Burns and Nick Balla are no longer going to be taking over the ~BAR TARTINE~ space and turning it into their restaurant, Crescent. It sounds like a deal couldn’t be reached, so they will be moving on after their last service on New Year’s Eve (December 31st). Scoop reports they will still try to find another location for the concept, ideally in the Mission. In the meantime, the duo will also be going full tilt on their new project, Motze, which is due to open on Valencia very very soon, possibly this weekend. No word on what Tartine’s Chad Robertson and Elisabeth Prueitt have in mind for the space just yet, although they will be keeping it—and it has that monster oven still in there, so this should be interesting.